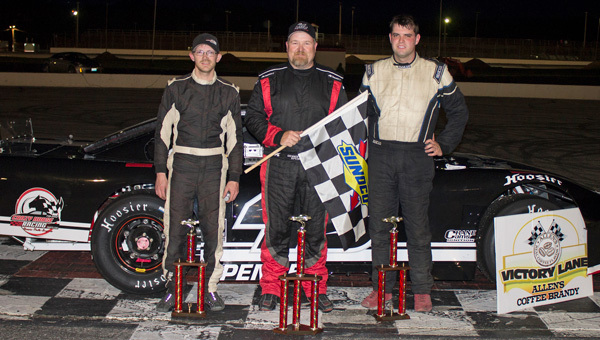 Oxford, Maine -- Hometown racer and former track champion Dennis Spencer, Jr. turned in a dominant performance in the 50-lap Super Late Model feature race, topping the Budweiser Championship Series racing card Saturday night at Oxford Plains Speedway. Turning in the fastest laps of the night despite the fact that key members of the crew were touring at an out-of-state racetrack, Spencer swapped the early race lead with fellow former multi-time track champion TJ Brackett of Buckfield before running away to victory by 4.79-seconds in a non-stop 50-lap race, completed in 13 minutes, 19.555 seconds. Scott McDaniel of Livermore Falls turned in an impressive run, claiming runner-up honors in front of TJ Brackett, who filled out the podium spots in a season-best run. Buckfield's Kyle Treadwell posted a season-best fourth-place finish. Ellsworth's Andy Saunders rounded out the top five. Spencer and TJ Brackett won 12-lap heat races. David Whittier of Poland prevailed in a quick and clean 30-lap Allen's Coffee Flavored Brandy Street Stock main event. Lisbon's Rick Spaulding was the best of the rest, posting a season-best, second-place performance. Billy Childs, Jr. of Leeds unofficially took over the lead in the Street Stock championship standings with a third-place finish. Turner's Matt Dufault was fourth, followed by Rodney Williams Racing teammate Bryce Mains of Lisbon. Whittier also won the 10-lap heat race. Scott Jordan of Auburn took charge of the 20-lap Bandits division feature race with about five laps to go, winning the race after hanging tough in the outside groove for the first three-quarters of the distance, while challenging rookie Eric Stoddard of South Paris. Stoddard, who led most of the race, earned runner-up honors, with Cam Childs of Leeds claiming third-place hardware in post-race ceremonies. Turner's Tyler Green coasted to a fourth-place finish, ahead of former division titlist Shaun Hinkley of Oxford. Stoddard and Philip O'Neil of Turner won heat races for the Bandits class. David Smith of South Paris exploded from mid-pack into an early race lead that he would not relinquish in the 15-lap Figure 8 race, adding to his triple-digit win total in the class. Kyle Kilgore of South Paris scored runner-up honors for the second straight week. Dale Lawrence of Lisbon was overjoyed with a third-place Figure 8 race finish, earning his first trophy in the challenging class. Tommy Tompkins of Carthage had a two-race win streak stopped, crossing under the checkered flag in fourth position. Greg Durgin of South Paris rounded out the top five. 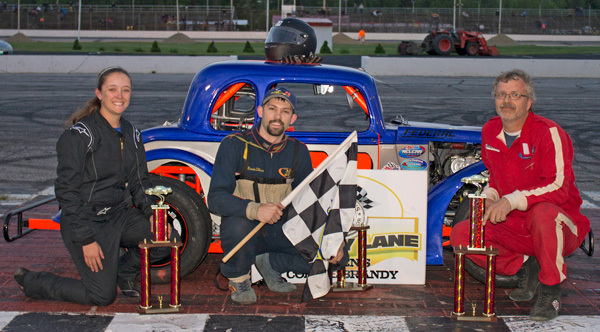 Kevin Oliver of Gray scored his first main event triumph in three years, winning the 20-lap Legends Cars race. Poland's Peter Craig challenged Oliver throughout the event, posting a close runner-up finish in his first OPS appearance this season. Parsonsfield's Annette Humphrey outran her boyfriend to claim the final trophy. The Budweiser Championship Series continues Saturday, June 3 at 7:00 p.m., with PASS Mods joining the Super Late Models and other weekly BCS divisions. Oxford Plains Speedway is located at 877 Maine Street, on State Route 26 in Oxford, Maine. For more information call (207) 539-8865. Budweiser Championship Series stock car racing results from Oxford Plains Speedway; Oxford, Maine; Saturday, May 27, 2017 showing finishing position, car number, driver's name, driver's hometown. Budweiser Super Late Model (50 laps) 1 46 Dennis Spencer, Jr., Oxford; 2 14 Scott McDaniel, Livermore; 3 61 TJ Brackett, Buckfield; 4 44 Kyle Treadwell, Buckfield; 5 01 Andy Saunders, Ellsworth; 6 94 Shawn Martin, Turner; 7 36 Ryan Robbins, Dixfield; 8 60 Tim Brackett, Buckfield; 9 10 Kyle DeSouza, East Providence, RI; 10 9 JT Thurlow, Windham; 11 9 Alan Tardiff, Lyman; 12 53 Alan Wilson, Hebron; 13 54 Ryan Deane, Winterport; 14 8 Calvin Rose, Jr., Turner; 15 23 Brandon Sprague, Edgecomb; 16 13 Cody Tribbet, Richmond; 17 13 Nate Tribbet, Richmond; 18 Travis Dunbar, Auburn; 19 71 Gary Chiasson, Peru. 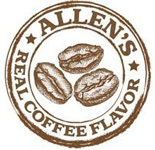 Allen's Coffee Flavored Brandy Street Stock (30 laps) 1 58 David Whittier, West Poland; 2 36 Rick Spaulding, Lisbon; 3 1 Billy Childs, Jr., Leeds; 4 61 Matt Dufault, Turner; 5 77 Bryce Mains, Bridgton; 6 4 Jordan Russell, Norway; 7 11 Tyler King, Livermore; 8 33 Andrew Breton, Greene; 9 2 John White, Turner; 10 42 Kim Tripp, Oxford. Bandits (20 laps) 1 36 Scott Jordan, Auburn; 2 95 Eric Stoddard, South Paris; 3 11 Cam Childs, Leeds; 4 26 Tyler Green, Leeds; 5 2 Shaun Hinkley, Oxford; 6 56 Addie McDaniel, Bridgton; 7 3 Chachi Hall, Oxford; 8 5 Jacob Hall, Oxford; 9 51 Adam Sanborn, West Paris; 10 1 Brandon Varney, Auburn; 11 14 Adam O'Neil, Lewiston; 12 08 Mike McKinney, Berlin, NH; 13 18 Brian Hoscock, Turner; 14 04 Tyler Jalbert, Auburn; 15 77 Rob Crepaeau, Minot; 16 39 Randy Henderson, Buckfield; 17 24 Travis Verrill, South Paris; 18 68 Eric Parlin, Mechanic Falls; 19 55 Dean Jordan, Jay; 20 71 Chris Foster, Lisbon; 21 33 Matt Hiscock, Turner; 22 52 Mike Nichols, Livermore Falls; 23 151 Kyle Hewins, Leeds; 24 2 Phillip O'Neil, Turner. INEX Legends Cars (20 laps) 1 28 Kevin Oliver, Gray; 2 4 Peter Craig, Poland; 3 0 Annette Humphrey, Parsonsfield, 4 64 Devin LeRoux, Parsonsfield. Figure 8 (15 laps) 1 54 David Smith, South Paris; 2 4 Kyle Kilgore, South Paris; 3 2 Dale Lawrence, Lisbon; 4 113 Tommy Tompkins, Carthage; 5 41 Greg Durgin, South Paris; 6 07 Kyle Glover, Oxford; 7 40 Robert Morey, Lisbon; 8 97 Eric Hodgkins, Minot.